What are the different Brand Name Strategies? As name suggest, each product will have it own brand name. This will have the benefits of protecting the one product from being affected from the failure of another product.If one product get failed in market then another product would not affected by it. For Example: P & G, P& G has different brand name for its different product like pampers.Similarly HUL sell different branded product like Dove, Sun Slik etc. However, the greatest demerit would be that all brand will require a separate promotion there by increase the promotional expenses. In this strategy, every product the company offers to market bears the same brand name. Here the term Blanket is used to denote that a common brand name is used a common blanket on all the product.All the product will bear a same common brand name. The greatest advantage would be the promotional cost would be less and sales would be higher for new product if the brand name is well know. However, if a single product fail in market then it would have a great impact on the whole brand including a sucessful brand to some extent.For example: Apple, it use Blanket Family Name for its all Apple branded Product. You will find a brand Apple logo on all its product. It is generally used by the companies producing the unrelated product in different sector. You can say it is used by company that are highly diversified in a unrelated product. The biggest advantage is that it is easy to implement a brand extension strategy for launching a new product or modified a product under successful brand name.Further there will be less expenditure on promotion and research and development. For example: Reliance Power, Reliance Telecommunication etc. Another Example Would be Aditiya Birla, TATA etc. 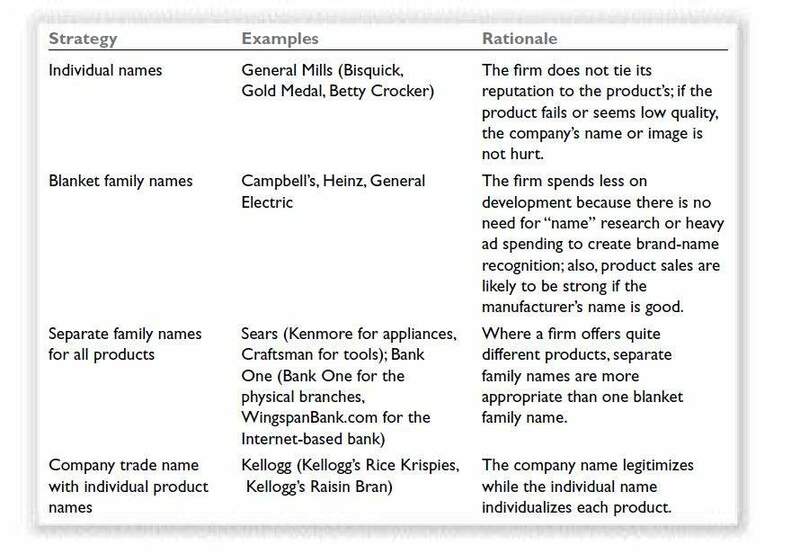 In this strategy, Company is using a company's name as a product brand name.You will find the name of the product will all its products.This company use the brand name with all its product.The biggest advantage is that it will reduce the promotional expenses and would easily accept the new product if the name of the company is well know. For example : Kellogg's (Kellogg's have its brand or company name on all its product like Kellogg's Frosted flakes, Kellogg's Choco etc.). Another example of Company trade name with Individual Product name are Dabur,Microsoft,IBM etc.